Lizzie Post : I'm Lizzie Post, and I am the co-author of Emily Post Etiquette, the 19th edition: Manners for Today. Suzy Chase: Your great great grandmother, Emily Post, is synonymous with proper etiquette and manners. Tell us a little bit about her. Lizzie Post : Oh my goodness, that depends. What part of her would you like to meet today? Suzy Chase: What was her inspiration? Lizzie Post : She actually was quite encouraged by others to do this. This was not something that really inspired her. Well, that's not really true. There's two kind of factors here. One is that in 1915, she spent a couple months actually driving from New York City to San Francisco. She was doing a serial, I think from McCall's magazine, where she would send back the stories of her travels. She got to Chicago and just absolutely ripped them to shreds for how uncivil they were ... the state of the hotel and the this and the that and she got a lot of flack for it. People wrote back and they basically said, "Yeah, well you live in a New York City bubble." It really opened her eyes up to how she should be absorbing the rest of the United States during this trip. It was really what, I think, made her etiquette advice so accessible was this experience of traveling, sometimes across the country in areas where they didn't have roads yet or where women had to eat out back. I think that that kind of gave her some inspiration in terms of really thinking of being an author and a writer for all Americans, not just the privileged Americans. That is one area of inspiration. Lizzie Post : Shops for a husband and winds up with a husband who has a title and no money. She writes this wonderful thing about how to be the most gracious hostess, even when all you can serve are little sandwiches or something like that. It's really sweet. So, she was a romance writer. She kept getting these calls from this Mr. Duffy. She finally called her editor and said, "Can you please tell him just stop trying to sell me dictionaries?" They said, "No, he's not a dictionary salesman. He wants you to write a book on etiquette." She said, "Oh that's ridiculous. The whole thing could be boiled down to a few pointers." And 627 pages later, she had something to say. Suzy Chase: That is crazy. Lizzie Post : That's really kind of how it came about. Suzy Chase: Why do we think etiquette has always had to do with upper class, high society? Lizzie Post : Well, I think because high society manages to create rules for itself. For whether they are based in practicality or not, some of them are extraordinarily practical rules that have stood the test of time. Others were incredibly affectatious and meant to separate and to divide. Those are the things that have dropped by the wayside as we've moved forward and certainly as the elite has become a smaller and smaller section of American culture. But, I think that mostly aspiration is something that we Americans like. We like that dream of doing better, making more. We often look to the people who have more to see how they behave and what goes on. I don't always think of the best example of what to do. I think that in Emily's day that was very true. I think nowadays there's much more, I think, an appreciation of the middle class and how they live. I think that we being a part of the middle class really kind of encompass a larger, more open and accepting view of etiquette than I think some of the ... well, like the New York 400, you know, the elite back in Emily's day. Suzy Chase: So, etiquette has changed over the years? Lizzie Post : Oh my goodness, so much so. We say that etiquette at the Emily Post institute ... We've kind of created this little math formula where etiquette equals manners plus principals. Manners are things that let us know what to expect from others and what we can expect to do in any given situation. Those are tied to cultural boundaries and they're tied to time. A lot of the actual manners that Emily wrote about in 1922 aren't necessarily the manners that we're using in 2017. They were really, you know, of days old. I do not need a single woman to walk around with a chaperone. It is not appalling for me to be in a gentleman's apartment after certain hours, regardless of our romantic affiliation. Those sort of things have fallen by the wayside as time has changed. When it comes to cultural divisions, we in the United States are very comfortable with the handshake. Nowadays, a hug is still questionable but a very common greeting, although some ... I know a lot of women really don't appreciate the hugs that are starting to happen in the business world between men and women. I find that interesting. This would be an example of how we do in America, whereas over in Europe, a kiss on the cheek might be the appropriate greeting. A bow is often an appropriate greeting. I think that it's important to recognize that manners really are the specific action that you're doing, whereas the principals that we talk about are the guiding principles of consideration, respect, and honesty. At the Emily Post Institute, that's what we base all of our new etiquette on. We look at these values and we say, "Who's being affected by this situation?" How can we make sure that all of the people who are involved in it are being respected? What honestly is the best thing for everyone involved, in terms of this scenario? Those principles, they cross cultural boundaries, right? What is a greeting? A greeting is saying to someone, "I'm happy to have had you in my presence." I'm happy to meet you. I'm happy to greet you. I'm happy to spend time with you. I want this to be friendly. You're putting all that good intention out there. That is consideration, respect, and honesty. We go back to the days of knights when you had to be honest and your greeting was showing that you didn't have a weapon up your sleeve basically. It's kind of interesting how the two together combine to have really strong guidelines for contemporary behavior and interactions among each other. Suzy Chase: You mention the Emily Post Institute. Tell us a little bit about that. Lizzie Post : The institute was founded in 1946 by Emily. It was her way of passing down her legacy to her family members. She founded it in 1946 with her son and then it has passed down for each generation that has wanted to continue the family tradition. There has always been an opportunity, at some point, where the baton is being passed. My parents' generation decided that, rather than pass the baton when they wanted to retire, that they would pass the baton earlier and really coach my generation and give us the support to be able to enter into this field, develop ourselves within it, and then ... this has occurred over the past decade ... Now as they've all looked towards retirement, we're really ready to spread our wings and fly. 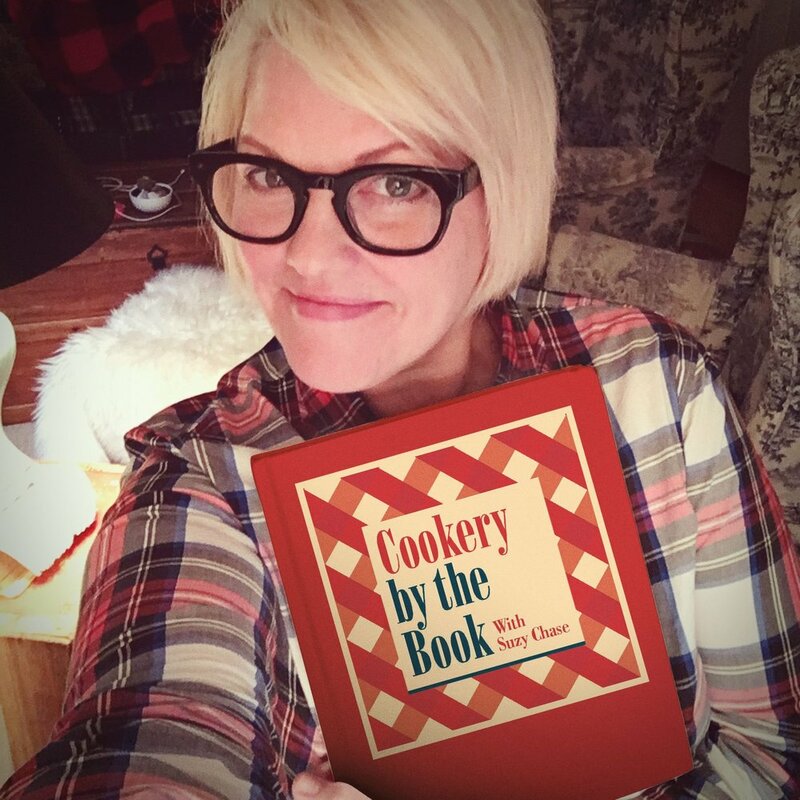 Suzy Chase: As this is a cookbook podcast, I would love to be able to focus on table manners and food. What are your top table manners? Lizzie Post : And the meatloaf, please tell me it came out well. Lizzie Post : I'm sensing like, no it wasn't quite the best you've ever had. Suzy Chase: No, no, no. The thing is it ... It was such an old fashioned recipe. It was really heavy, but it tasted really good. Lizzie Post : I was going to say that it was probably fat and fat and fat and add some more fat. Suzy Chase: And then add some liver. The liver was the most hilarious part of it. Lizzie Post : Right? Oh my goodness. The things in that book crack me up and I wanted to try more of the recipes but I've only gotten to a few and I'll admit, it was years ago. I don't remember what I've tried. Suzy Chase: The cookbook just takes you back to the '50s and can we talk about the cover? Suzy Chase: It's so architectural and hip and modern. Lizzie Post : I love them. Sorry. I know you asked me about what are my top table manners, but I had to get that in there because I've been so curious since I saw the bacon wrap post. I was like, "Oh my gosh. I love it." Suzy Chase: Yes, it was really good, yet heavy. Lizzie Post : Yes, I can imagine so. Lizzie Post : This is a pet peeve for me. I understand that other people are like, "No, that's not a big deal. Why are you so grossed out by that?" To each his own. I can't stand that. I could not eat in the same room as him because I was just like, this is horrible. I can't ... it's totally unappetizing. That, to me, is like the most egregious thing, more than if you picked up something and ate it with your fingers, opening your mouth when you've got chewed food in it. Showing that to other people, whether knowingly or unknowingly, is the most grotesque thing you could do at the dinner table. Suzy Chase: I would have to agree. When is it okay to put your elbows on the table? Is it ever? Lizzie Post : Yeah, this is a funny one. Contrary to my sister's lovely depiction ... When I was little, she always had inventive ways of getting me to pay attention to etiquette. She told me that there were table fairies and that if you put your elbows on the table, and she doesn't remember this at all, which cracks me up, that you would kill the table fairies. You don't put your elbows on the table. I, being a very imaginative child, did not want to kill any table fairies. The truth is that Emily never had a problem with elbows on the table. The trick is to do it in a way that engages you with the conversation, not in a way that shows that you are bored or tired or can barely hold your own head up without the support of a fist. I think it's really important that you not do it when you have food actually in front of you that you're eating, because then you kind of look like you're guarding your food, as if the person next to you or across from you might steal it away. I think you want to wait until you are finished eating and either your plate is removed or it's clear you're no longer protecting your plate. You can lean into it a little bit. I'm actually doing it now as we speak on my desk, trying to think of how to describe this. My elbows are on the table. I'm leaning in, my hands are free. I can, even though you can't see me, I'm gesturing as we talk. I can feel engaged and a part of that conversation, whereas if I've got my chin in my palm and I'm kind of slouched and slumped, that's just not ... that's someone who I feel like I would want to say, "I'm sorry, do you want to be excused? Do you need to go to bed?" Suzy Chase: Yeah, you can go now. Lizzie Post : Is it too much for you to be here now? Suzy Chase: So when we sit down at the table, do we ... my mom always told me to immediately put your napkin on your lap. Is that right? Lizzie Post : Yes, absolutely. When you sit down at the table, immediately put your napkin in your lap. It gets you started with everything. It also means you're not going to forget it and, you know, just leave it on the table with the silverware under it or next to it. I think also on the offhand chance that an accident did occur, your napkin is right there in your lap ready. It's not waiting under some unused silverware where you might ... in your rush to clean up your mess, I don't know ... manage to throw a fork or clatter things or make disruption. It just makes everything easier if you just put that napkin in the lap right away. Suzy Chase: Now, if we have a wine or champagne glass with a stem, should we hold it by the stem or underneath the glass part? Lizzie Post : You hold it at the stem if it's chilled. You hold it by the cup or the bulb when it's like a red wine, something that you want warm. The warming of the hand can help. Suzy Chase: Give us your handy tip to remind us that the bread goes to the left and drinks go to the right. Lizzie Post : Absolutely, this is a fun one. A little hard to describe without a visual but everyone knows the A-OK sign where you touch your thumb and ... you make a circle with your thumb and your forefinger and then you've got your other three fingers pointing out. If you align your other three fingers, you'll notice that your left hand looks like it makes the shape of a B, a lowercase B. Your right hand looks like it makes the shape of a lowercase D. The B is on the left, the D is on the right. Sure enough, your bread plate should be on the left of your plate setting and your drinks are to your right. If you're at a really crowded table, you can always kind of know which is yours and which is ... well I hope you know which is which between a bread plate and glass. You'll know which is yours based on BD and you can just do that right under the table or picture it in your mind. Suzy Chase: Speaking of bread, I think the bread and butter is always a tricky one. Suzy Chase: What is that rule? Lizzie Post : Doesn't everyone want to just slather it and make a butter sandwich, where it's all melty and good or maybe even put some gravy on there? I know I do, but when I'm with others and not trying to gross them out ... The best thing to do with bread is you pick up your piece of bread, you break off a bite size piece, put down the rest of the roll, and then you ... you've taken a ... Either your pat of butter is already on your plate or it has its own separate container for you, or if butter is being passed around the table, you use the butter knife to slice a pat of butter off, put it on your plate and then use your own butter knife or your own knife to butter your bread. You don't want to use the communal knife to butter your bread. You don't want to use the communal knife to be buttering your bread. That's the one thing you try not to do. You butter your bread actually against the plate. That way if you're buttering in mid air you don't ... I mean, butter is a grease so it's slippery. You don't want to, all of a sudden, have it hit your fingers and drop the bread and clang your silverware, that sort of thing. Lizzie Post : Like not fully room temperature butter. And then the bread just hits the plate, or you drop your knife or something like that. Lizzie Post : And then you know? I know faux pas. No one's going to like, not have dinner with you if you butter your bread in the air, but if you want to know the true proper way to do it, it's you break off the bite size piece and butter against the plate. Suzy Chase: Those pats are always frozen. Lizzie Post : They are. What is up with that? Suzy Chase: I don't know. Lizzie Post : How hard is it to take the butter out at the start of the day and then put it back away at the end of the day? I don't know. Someone can write in and tell us that it's sanitary reasons or something like that. Suzy Chase: So does this rule follow with biscuits and muffins? Lizzie Post : Yes, I would imagine so as well. Anything like that where you have to butter it or put a spread onto it. I think even if you were doing ... Maybe you had an olive tapenade or something like that, I would still recommend spreading it against ... by holding that bite against the plate. Suzy Chase: How do you know when it's okay to eat foods with your fingers? Let's play a quick game of fingers or fork. Lizzie Post : Fork or fingers. This is a great game, and anyone who is teaching young children, this is a fun one. So fork or fingers, just so you know, is a highly debated topic around the institute, and especially as a child between my parents. If we get to asparagus, I'll let you know what they came down with. But fire away, fork or fingers. Suzy Chase: Let's kick it off with asparagus. Lizzie Post : I would say that no matter what, I tried to not use my fingers if we're in a very formal setting. And you shouldn't be getting foods that are making you question it in a formal setting, but just in case. Suzy Chase: What about bacon? Lizzie Post : Bacon. If it is crisp, you can and not greasy and messy, you can eat it with your fingers. Otherwise, if it's limp, you should eat it with a fork. Lizzie Post : That would be really ... Sorry, I was just thinking. It would be really hard to try and eat crisp bacon with a fork. I feel like that would be futile. Lizzie Post : You know what I mean? Suzy Chase: It'd be a million little pieces. Lizzie Post : Keep breaking into crumbs. Lizzie Post : I can't enjoy you anymore. Lizzie Post : Well, what type of chicken? Suzy Chase: Let's say chicken breast. I guess you'd cut that up. Lizzie Post : Is it on the bone or not on the bone? Suzy Chase: Oh. Let's say on the bone. Lizzie Post : Okay. On the bone, I would say you have options. On the bone and fried, you're more likely to pick it up. On the bone and roasted, I would not be picking it up. Too juicy, too messy. Even fried chicken, again depending on where I'm at and depending on what my host is doing, I'm going to be really careful about picking up something that's not a drumstick. Lizzie Post : Oh, totally a finger food, if they are served with other finger foods like a burger or something like that. If they're served covered in gravy, which we have a place in Burlington called Nectars that's famous for its gravy fries, which we of course always eat with our fingers disgustingly but that's something else entirely ... If it's got a sauce on it, if it's got gravy or if you put ketchup all over it, you should use your fork. I would also say that if you get them as steak frites, I would be more likely to use my fork for steak frites kind of dinner than I would for burgers and fries. You kind of have to play that one by ear. Lizzie Post : Definitely use your fingers for almost every single time you eat it. Again, if you're at a slightly more formal place and a flatbread got ordered, I might consider picking up that fork and knife just so that if I'm at a business meal or if I'm really not trying to distract in any way from the conversation. I just don't want to get messy and greasy and if cheese is at that right temperature, it just stretches for forever and ever and ever. You don't want to be caught in that scenario when you're trying to impress somebody. Lizzie Post : Okay, tail on or tail off? Suzy Chase: I'd say tail on. Lizzie Post : Tail on, it's a finger food unless it's tail on and in a fra diavolo or a pasta primavera, something like that. As long as it's not coated in sauce, if it's just served like shrimp cocktail, as long as it's got that tail, think of the tail like your handle. It's okay to then dip, bite, and put the tail down. If it's been served without the tail, you should probably go with the fork. If it's only been served with a teeny, tiny fork, which sometimes happens, you should try and use the fork as best as you can. I always think that's a little silly. I think you should save the little teeny, tiny fork for the oysters that it's meant for. Suzy Chase: I love the teeny, tiny forks. Lizzie Post : It's cute, isn't it? Suzy Chase: It's so cute. Lizzie Post : It's like, really cute. But I hate being given it when you get jumbo shrimp and a teeny, tiny fork. I'm like, "Whose idea was this?" That just doesn't seem right. The shrimp is heavier than the fork. Suzy Chase: Okay. Tacos. That's our last one. Lizzie Post : Oh my gosh. Just so you know, I'm a taco fanatic. I love tacos. When I switched to being mostly vegetarian, they became my saving grace for a while. But tacos, if they're ... The trouble with tacos actually isn't ... They're a finger food 100%. The problem is that then you take one bite of a crunchy taco and half the taco has fallen out and most of the shell has now crumbled and it's a total mess. At that point, you can move to fork and start kind of scooping things onto the fork and eating it. Suzy Chase: So before we wrap, I'd love to know what you think about the word invitation being more into invite. It drives me crazy. Lizzie Post : Does it? So I admit, that one does not drive me crazy. Lizzie Post : I know. I'm sorry. I wish I could hate it as much as everyone else does. I'm just lazy. I'm just so used to seeing invite, but I am actually that person who has to remind herself when she's typing stuff and writing about etiquette that oh good, we have to call this an invitation. It's not an invite. I think invitation is certainly the proper word to use, but the shorthand has definitely become invite and it is everywhere. Suzy Chase: Yeah, invitation is a noun and invite is a verb. Lizzie Post : Yeah, exactly. Suzy Chase: It makes me bonkers. So where can we find you on the web? Lizzie Post : We are at emilypost.com. You can also find us on Facebook and Twitter as post ... Well, on Twitter we're the EmilyPostInst. On Facebook, we are the Emily Post Institute, as well as Awesome Etiquette. Suzy Chase: Emily Post once said, "Etiquette is the science of living. It embraces everything. It is honor." It was such an honor chatting with you, Lizzie. Thanks for coming on Cookery by the Book podcast. Lizzie Post : Thank you so much, Suzy. I really appreciate the opportunity. I'm going to have to break out my Emily Post cookbook and try out some of those recipes you found.